Last night we got our usual fireworks show from the comfort of our own home, compliments of the Country Club next door. I told Genevieve she could try to stay up until midnight. She made it to 11:30. I think I was asleep at 12:02. Well, we're back to snow now. Looks like the crazy weather may be over and we'll have the usual miserable winter weather. (One good thing about being pregnant is that I'm NOT cold!) 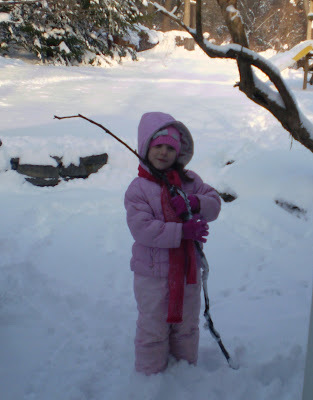 For the first time today Genevieve actually wanted to go out and play in the snow. Most of the time she takes after me and hides from the cold. It was the first time we had some sun along with deep snow, so maybe that's why. Or she's just going stir crazy from being in the house for two weeks.